BookBairn adores stickers! What kid doesn't?! We have used a mountain of sticker books over the last couple of year and most of them have provided hours of entertainment (though beware of the 'activity sticker' book which has more activities than stickers and are too tricky for toddlers!). But we have recently been having lots of fun with 'Stickerscapes' by Caroline Selmes. We have the tropical edition which is a double sided-large panoramic scene. One side represents the dense tropic jungle and the other features the bottom of the deep blue sea. With 100 stickers (they are described as reusable but we found them very tricky to peel off and they curled up and were fiddly to restick but it's in the same price range as other non-resuable sticker books so this shouldn't necessarily put you off but I wanted to share our experience so that you are aware) it has kept BookBairn busy for ages. The panoramic page tears out of the book so that out can spread it out across the floor and flick through the sticker pages choosing easily. On the reverse of each sticker page there is also an encyclopaedia and short description about each of the animals stickers so you can learn whilst you stick and play. 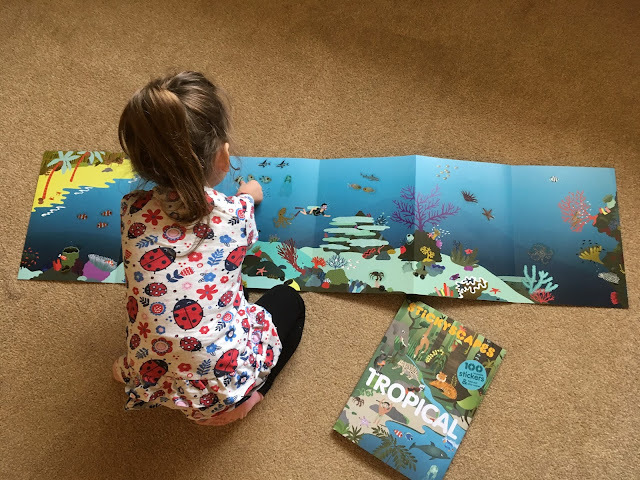 This makes it a great one to do with your children so that you can boost their experience by sharing that synchronised gaze that I mentioned in our recent post about seek-and-find books. The illustrations are cute and fun and the ability to create your own scene full of your favourite animals will delight little ones! BookBairn loved doing this one together and delighted in the size and scape of the sticker page! Have you come across any particularly good or unusual sticker books? We'd love any recommendations. Disclaimer: I was sent this sticker book for review from the publisher. Words and opinions are our own. BookBairn loves sticker books and it is quite noticeable that she is becoming much more careful about where she places the stickers. She loves her new Disney sticker book too!